A closer look at what Jefferson County coaches look for in players and different athletes. Every coach has a different style of coaching, a different approach on how to coach a specific sport and every athlete has different skills and different mindsets. Some coaches look for certain attributes in an athlete and some for a mindset to specifically fit the sport they are coaching. An athlete's personality and attitude can not only affect how coaches will coach, you but how they position you to fit on a team. A quarterback on a football team is going to have a very different mindset than a middle linebacker. Same with a point guard on a basketball team, compared to a post player. What are coaches looking for in athletes and what are the mindsets and attitudes that coaches are looking for in an individual sport? Coaches have an overall list of qualities they would like to see in an athlete, but they also have a list of qualities to fit certain positions. When it comes to an individual sport, like track or wrestling, a coach's idea of what kind of athlete he or she is looking for is different from that of a coach for a team sport. Jefferson County coaches look for attitude, mental toughness, and ability to be a team player. "Wrestling is one of the few sports that with the right attitude and mindset, anyone and every body type can be competitive and contribute," said head Culver wrestling coach J.D. Alley. 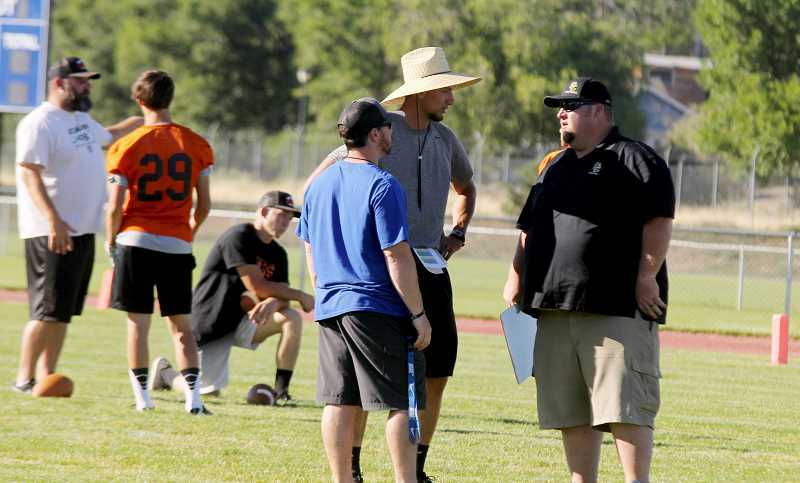 "What I look for in an athlete is selfless and dedicated," head Culver football coach Jesus Retano said. "When I think of the perfect kid I want to coach, I think of someone who puts others before themselves. That always go 100 percent no matter what drill or conditioning we're doing. Leadership is a must have — not because they have to, but because they want to." "If I was to list out top priorities that I have for a high school athlete, talent would fall somewhere close to the bottom," said Madras track and cross country coach Andrew Jensen. "The things that I value far more than talent or ability are focus, attitude, effort, integrity, work ethic, ability to be a part of a team, and coachability. These are the things in life that you can control; ability is something that is hereditary. With hard work and the humility to be coached, ability can improve, but other than that, I feel that ability is something you are born with. Of course, all coaches enjoy having athletes on their teams that are athletically gifted. That said, I would rather have an athlete that works their tail off every day in practice, has a great attitude, and is focused than someone that is naturally gifted, has a bad attitude, and believes that they are bigger than the team." "Successful wrestlers need to have a good degree of mental toughness and a high level of pain tolerance. Some of that can be learned and adapted to over time," said Alley. "Developing the mental side of an athlete is especially important for a cross country runner," said Jensen. "Cross country is one of the hardest sports mentally, because at the end of the day, you are the one that must overcome adversity to succeed. Running is really hard and requires a special person to want to push their limits like a cross country runner. It's not for all athletes." "I have never thought of wrestling as an individual sport," Alley said. "In the end it is viewed and measured as a team sport and good teammates that can work together to overcome adversity are the cornerstone of a solid program." "There are big difference in individual and team sports," Retano said. "You could be a state champion in an individual sport, but your team isn't very successful in football. It brings out their true colors. When your team isn't successful and you are doing everything you can, you can either point fingers and bring people down or you can continue to work and go through hell with your brothers." "In cross country and track, I focus a lot on developing a team culture," Jensen said. "Yes, these sports are considered 'individual' sports, but I coach them as if it were any other team sport. I feel that building unity is really important and I really value the bond that many traditional team sports share. That said, when individual athletes step on the starting line of a race or event, they, of course, will rely on their teammates in several different ways, but at the end of the day, it is up to them to accomplish the task, and not their teammates." "I want everyone," said Alley. "Wrestling can accommodate anyone from 90-300 pounds, whether they be tall and skinny or short and stocky. We had a kid once that wrestled in the state finals at 103 pounds and was 6'1" and we've had a someone at 5'8" 195 pounds." "In track, we try and give kids opportunities to try as many different events early on in the season as possible (we encourage it, actually)," Jensen said. "You can tell quickly whether or not someone is built for a particular event. After a few weeks, we sit down as a coaching staff and look at where our holes are and try and fill them. Each athlete on the team is required to do at least two events, with most of our athletes doing three to four events."